As part of the California Global Warming Solutions Act of 2006 (AB 32) the ARB approved an early action measure to mitigate high-global warming potential (GWP) greenhouse gas (GHG) emissions from waste insulation foam used in refrigerators, freezers, and buildings. Insulating foams with high-GWP GHGs include rigid poly foams made from polyurethane, polyisocyanurate, and extruded polystyrene board stock and panels (fiberglass insulation does not contain GHGs and is not included in this early action measure). A foam recovery and destruction program was proposed for further study to assess the feasibility of reducing GHG emissions from waste insulation foam. Strategy Description: The Air Board encourages voluntary foam recovery and destruction in the appliance recycling sector and building demolition and renovation sector. 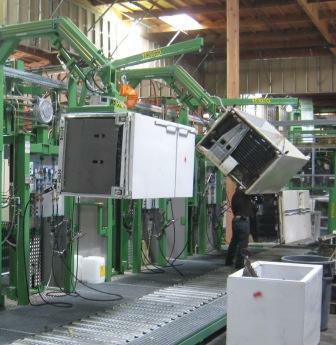 It is estimated that including foam recovery and destruction measures to appliance recycling would increase recycling costs by $17 - $43 per appliance. Recycling building steel-faced insulation panels with foam recovery and destruction would increase the current demolition and disposal cost of $0.25/lb. 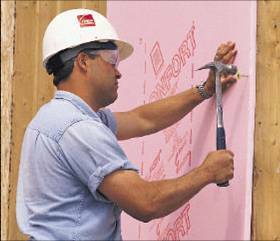 of insulation to approximately $6.60/lb. The additional cost of foam recovery and destruction could be defrayed through programs established for the destruction of ozone-depleting substances (ODS) and carbon credit/offset programs to be developed. For more information on these programs, see Greenhouse Gas Compliance Offset Protocol Activities and Cap-and-Trade. Caleb Management Services has completed a research study for the Air Board, titled “Developing a California Inventory for Ozone Depleting Substances (ODS) and Hydrofluorocarbon (HFC) Foam Banks and Emissions from Foams”. The study includes a greenhouse gas emissions inventory from foam sectors in California, along with projected GHG emissions through 2020, and estimates potential GHG reductions from foam recovery and management programs. ICF International has completed a research study for the Air Board, titled Lifecycle Analysis of High-Global Warming Potential Greenhouse Gas Destruction. The study includes analyses on the cost/benefit and greenhouse gas emissions reductions from recovering and destroying GHGs from waste foam derived from appliance recycling and building construction and demolition (C&D) waste. For additional background material on greenhouse gas emissions from waste insulating foam, click on the "Archived Documents" link on this page, then scroll down to "Reference Documents for Foam and Global Warming Issues"